Hey guys! It’s Leigh Ann from My Diary of Us here and I am so excited to be sharing one of my favorite breakfast taco recipes with you all! Kelly and I share the same love for tacos and so it just seemed natural to kick off my first contributor post with an epic breakfast taco combination. I love creating tacos of all flavor varieties right in my own kitchen for a street taco feel at home! My Banh Mi Breakfast Tacos are packed with all of the classic banh mi flavors folded deliciously between a tortilla and topped off with the perfect fried egg! Are you sold yet? Because let me tell you my hubby talked about these tacos for days after the first time I made them and couldn’t get over how delicious they were! This is coming from a man who eats breakfast tacos a few times a week on the regular! After all, breakfast tacos are a staple here in Texas! 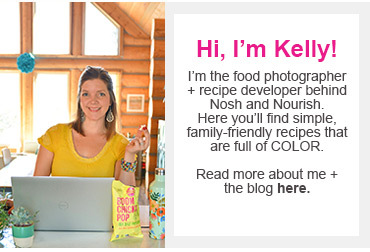 (Kelly was born in Texas, so her love for tacos totally makes sense!) I love switching up my breakfast taco recipes to keep things interesting! I have an almost three year old who also shares a love for tacos so I am always thinking about recipes that the whole family can enjoy. For kids, simply omit the jalapeños and chili sauce to make it less spicy! What I love about these banh mi tacos is that you can put the meat in your slow cooker overnight and breakfast will be ready in no time in the am. 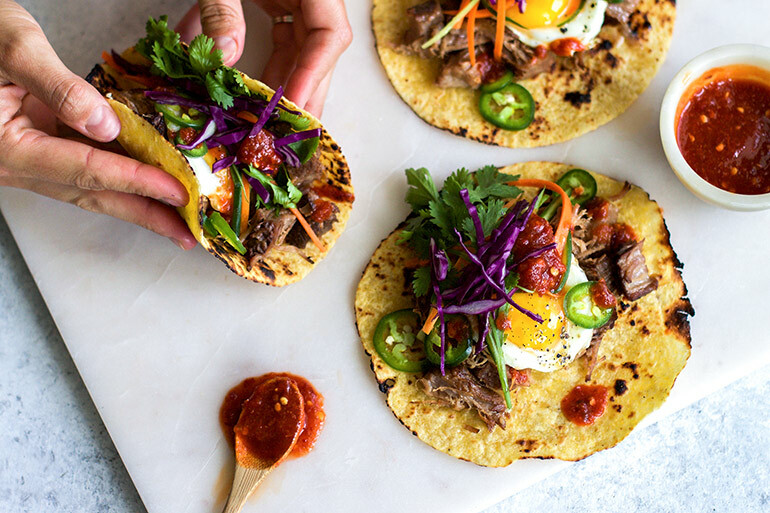 The tender meat paired with the a little crunch from the quick pickled veggies, a fried egg, and a little heat from fresh chilis makes these tacos a dynamite combination that you are going to swoon over! These tacos are perfect for brunch on the weekend with friends and family and they make quite a stunning presentation too! 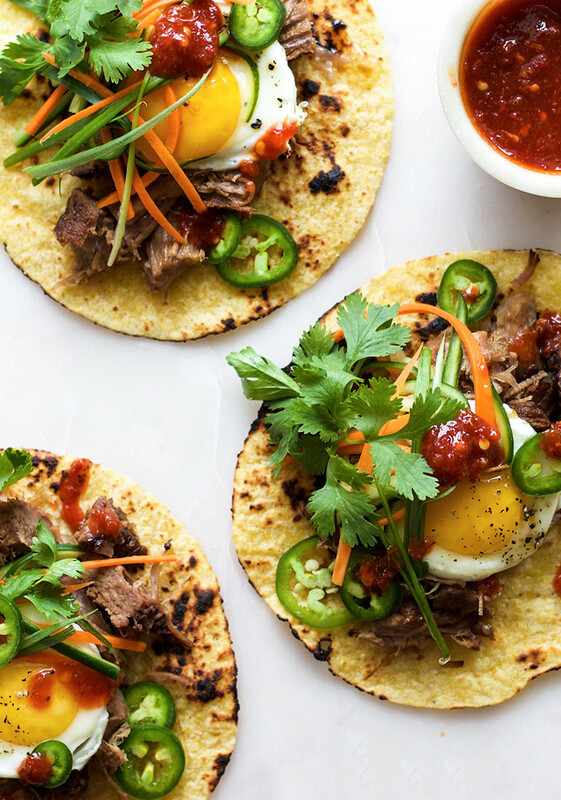 The next time you get a craving for breakfast tacos, try out these banh mi breakfast tacos and be prepared to fall in love! You are going to be blown away at the flavor explosion wrapped up in a tortilla! 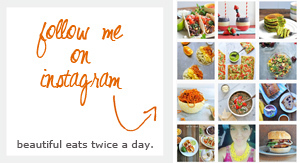 Don’t forget to tag @mydiaryofus and @noshandnourish if you make this recipe, we can’t wait to see your creations!